Early on during my pediatric ophthalmology fellowship in Ann Arbor, Michigan two years ago, I was already so unhappy and so I started looking into pastry schools. My sister, Michelle, had a friend, who has a husband, who has a sister, who is married to Chef Peter Fong, the owner of Ganache. (Confused?) He gave me some valuable insight into his own pastry experiences at Dubrulle. Two years later, my Pan Pacific Hotel practicum was in place but did not start until April 2007 and so I had January to March to fill up. Not wanting to lose momentum in my young pastry career, I contacted Peter again and as luck would have it, he needed someone temporarily during this time period! My time at Ganache is spent 3 days in the kitchen and 2 days in the front. Having absolutely NO retail experience ever in my life made the experience out front the most stressful so far. Dealing with credit cards, making change, and entering items in the register are novel experiences for me. Measuring strabismus in squirming 2 year olds still seems much easier to me oddly. Regardless, I am learning as fast as I can and it is becoming much less stressful. 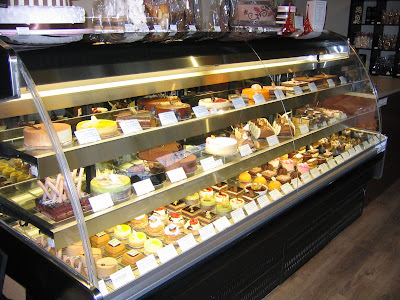 Ganache makes at least 20 different entremets/cakes as well as several traditional types of cookies (madeleines, financiers, canelles, macaroons etc) and chocolate items. Most cake items are made from 4-5 different components at least, which are then assembled and decorated. So far, I have made a handful of components, all in big quantities much different from school - for example, a raspberry-balsamic gelee, caramel-milk chocolate mousse, dark chocolate-raspberry mouse, german chocolate cake etc. They use many Flexipan molds and frozen inserts. Eventually, I will get to the stage where I will be assembling entire entremets and finishing them off completely! Posted by Charmaine at 7:49 p.m.